Welcome to UDFCD’s ALERT System. For quick access to a live rain map simply touch the logo. Also try our latest ArcGIS webmap to view real-time storm & flood data. 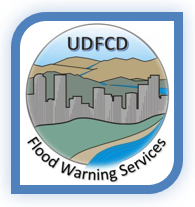 This site was developed primarily for our flood warning partners. Public users may prefer our Contrail® website. Be sure to check out Contrail’s current NWS Weather Story dashboard that includes related Twitter feeds & real-time storm totals. Also discovery interesting facts about this region’s worst historic floods from Boulder County’s Story Map. We hope you find this website easy to use.